Garden restaurants or cafés are my favourite summer (night) spots – List me your top 4! The “garden” of the restaurant Ziegel Oh Lac at Rote Fabrik is situated directly at the lakeside. Enjoy the delicious organic food, forget about everydays stress and just relax. And you’ll always have the possibility to jump into the refreshing lake before or after you satisfied your hunger. Check the Rote Fabrik website for concerts. During summer time, they normally take place at the ouside summer stage. Not very known is the hidden garden of Tantpis at Kreis 5. It is a good place to rest after an exhausting shopping tour around Josefstrasse. Order a homemade cake or other dishes from all around the world during daytime and a choice of products of the eastern or mediterranean cuisine at nights. Try the delicious Mezze. At Café Chez Andy, owner Andy Grenacher serves Kalte Plättli (12 CHF), great homemade cakes, Croque Monsieur, coffee and other delicacies. Now in summer time, you can savor them in the wonderful garden, under huge fig or kaki trees. This fairyland kind of place really is worth a visit with its quarters charm! Go see the little food shop and the art exhibition as well. Another city juwel is the Italian restaurant Rosso with its summer terrasse towards the railway tracks. Great Pizza and other Italian dishes, a glass of good wine and the industrial sourrounding make you feel very metropolitan. If none of these places suit you, also read our tips from last summer. I’m from San Francisco, staying in Zurich for a week. I’m hoping to find some lovely little, not-so-touristy place to eat. Any recommendations? 1. Gerold Chuchi is probably exactly what you are looking for, so don’t miss the “Gerold Börger” or one of the 3 daily homemade pasta dishes and enjoy them in an incredibly relaxed and inspiring industrial atmosphere. The special opening hours are listed on the website. The Hive Club is next door, if you like to party after dinner. 2. The garage-style restaurant Les Halles is a wonderful hideaway, offering mostly organic food from around the Mediterranean with a particularly French touch. Try the ever fresh moules et frites and get some French wine or local beer with it. It is a vibrant and busy place and you dine at long wooden tables, a perfect place to meet some real Zürcher! 3. 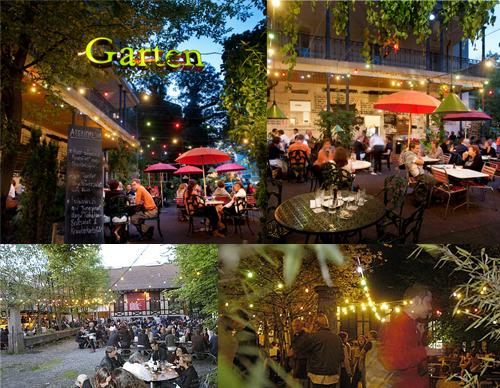 If the weather gets good again, Frau Gerolds Garten, situated in the industrial area as Gerolds Chuchi and Les Halles, is also a good option for a decent dinner in a great environment: Frau Gerolds Garten is a temporary sun terrace, summer restaurant, arts and city garden. Terrace, bar, kitchen and toilet area are built out of ship containers and you’ll find shadow under a huge circus tent. The side walls are brightly-painted, flowerbeds and vegtable patches create a „green“ atmosphere. It’s a perfect place to have a chat and an ice cold beer – an urban park in the middle of Zurichs industrial district. 4. El Lokal is in the city centre, not far from the central station – “the very last island on the Sihl”. They are open every day and offer good beer on tap and a great choice on delicious Tapas. You’ll love the special interior, the great music and the beautiful garden patio. The Department of Performing Arts and Film is in the same building, so many students from there spend their after-studying time at El Lokal. Also check out the website for concerts! 5. The Chuchi am Wasser in the cultural centre “Dynamo” offers quality organic food at a decent price. The best time to go there is on a sunny evening, when you can get some food and a local beer and enjoy them outisde, right next to the river Limmat. Other restaurants you might like are Italia, Maison Blunt, Gartenhof, Rosso, Da Michelangelo, Bauernschänke, Markthalle. How nice and warm it is outside! I would like to enjoy my dinner in a garden restaurant – where can I go? You are right, it finally got quite warm – time to stay outside as much as possible. There are different places we like a lot: at restaurant Italia you get served excellent italian food under big chestnut trees, Gartenhof has a lovely range of dishes and you sit in a cosy little garden, Palme de Beirut takes you east to enjoy libanese delights in a perfect green oasis. The huge garden of Reithalle invites you to eat fresh european cuisine and at Bayrischer Hof Biergarten there will be served typical bavarian food and beer, of course. Make sure to book ahead or be there early – every Zurich person wants to sit outside on the few warm summer nights we get over here! Where can I get a decent dinner without spending a fortune? In the last issue of the Tages Anzeiger Magazin Max Küng expressed his frustration about overpriced food in Zurich and wanted to know where in town he could eat a decent dish that wouldn’t cost more than 20 francs. We totally agree, eating in Zurich often requires a fat wallet. But there are some places where you can fill your belly and get away with 20 francs straight – you might have to cut back on first course, dessert and wine but you’ll be full and happy afterwards, we promise. So here we go: For hearty food, Aargauerhof is the place for you: Meatloaf with fries and a fried egg or rösti with bacon, cheese and a fried egg, both for 18.50. At Da Michelangelo you’ll get a Pizza Margarita for 14.50. It’s 18 francs for fish n’ chips and a salad at Rössli and 20 bucks straight for a sausage, fries and grilled veggies at Wurst & Moritz. For a variety of asian meals under 20 francs, rely on restaurant Saigon. Now myfriendfromzurich hopes that you’ll all enjoy your dinner! And Max, what do you think about our suggestions?